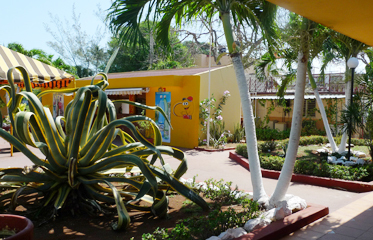 Varadero is not even close to typical Cuban city. It is all dedicated to the tourist industry, most important one for the country. 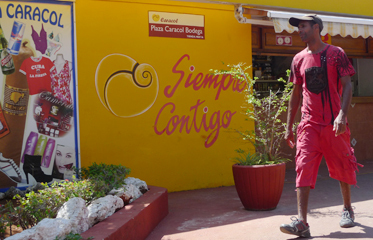 Avenida Primera [first avenue] is full of colourful craft markets, souvenir shops and nice cafes and restaurants, resembling any Central or South American city. This plaza, named Caracol, meaning snail, accompanied with appropriate clearly visible slogan siempre contigo [always with you] perfectly illustrates slow Cuban pace, absolutely necessary in today's world. 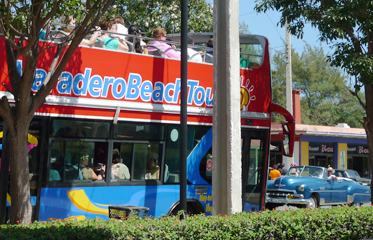 Space is stolen from the busy avenue and nice canopy provides pleasant shade where you can examine purchased items or enjoy cold drink or snack, until, newly introduced double decker bus servicing all 69 hotels along Varadero peninsula, arrives.